Join Audiobooks.com and listen to your first book on us. Once you've finished your free trial, you'll enjoy one audiobook every month for $14.95. If one book just isn't enough, you can buy additional credits at anytime. 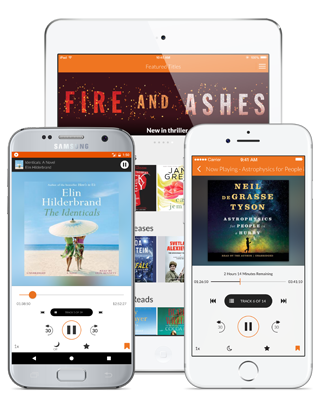 Download or stream audiobooks on your smartphone or tablet with our free apps for iOS and Android. We've introduced patent-pending technology that allows our members to listen in a whole new way. Start a book on your smartphone, pick up where you left off on your laptop and even fall asleep while listening on your tablet - you'll never lose your place. With more than 1,000,000 downloads and counting, we know you'll love it. Romance, thrillers, young adult. Fiction, business and bios - we've got them all in our library of more than 125,000 audiobooks. Browse around, check out our recommendations or take a look at what other members are listening to.